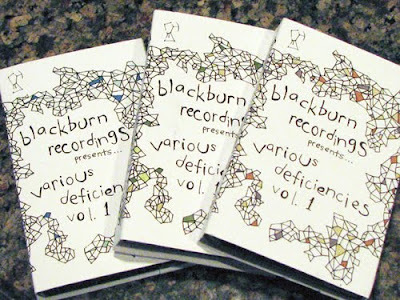 A few months ago we posted the exceptional debut compilation from Blackburn Recordings. Originally the mix, which featured the likes of Big Troubles, Coasting, Sultan, Sore Eros, Campfires, Cursillistas, Sleep Over, Cloud Nothings and Lame Drivers, amongst a ton of others, was only available as a MediaFire download. Well, now our homeboy Jonathan at Blackburn has taken the mix to its rightful home; the cassette tape. This limited edition of 130 features the art of Molly Smith, who hand-colored each tape. (Nice job Molly!) Blackburn was nice enough to hook Bobka up with a couple copies for giveaway. Name your favorite spaghetti western in the comments for a chance to win. Hm...enjoyed the Five Man Army. Definitely has to be Once Upon a Time in the West for me. "A Fistful of Dollars"... Clint and Morricone! It's the obvious choice.